VyCAP has developed solutions for the isolation of single CTC from whole blood for DNA or RNA analysis. 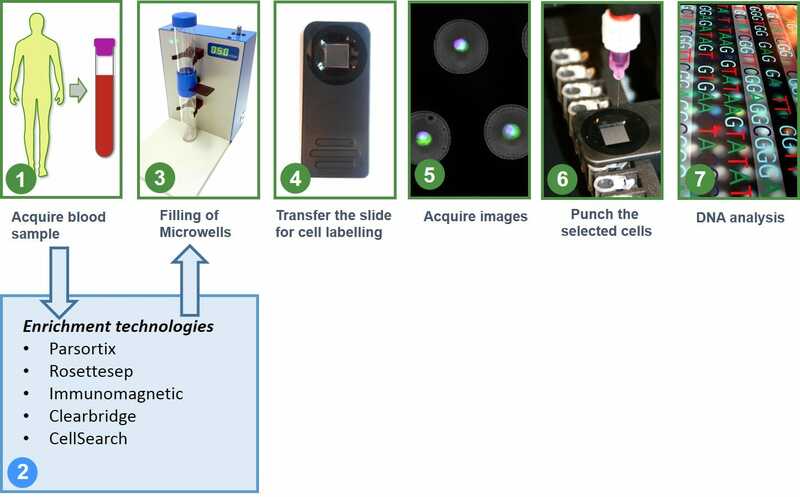 These solutions comprise of our Puncher technology for single cell isolation in combination with validated workflows and protocols. A total single CTC recovery of 30 – 50 % is established, starting from whole blood to a single CTC in a reaction tube for DNA / RNA analysis. After enrichment the sample volume should be between 0.1-40ml with up to 50.000 leukocytes. To detect the circulating tumor cells DAPI, CK-PE, CD16 and CD45-APC are used. 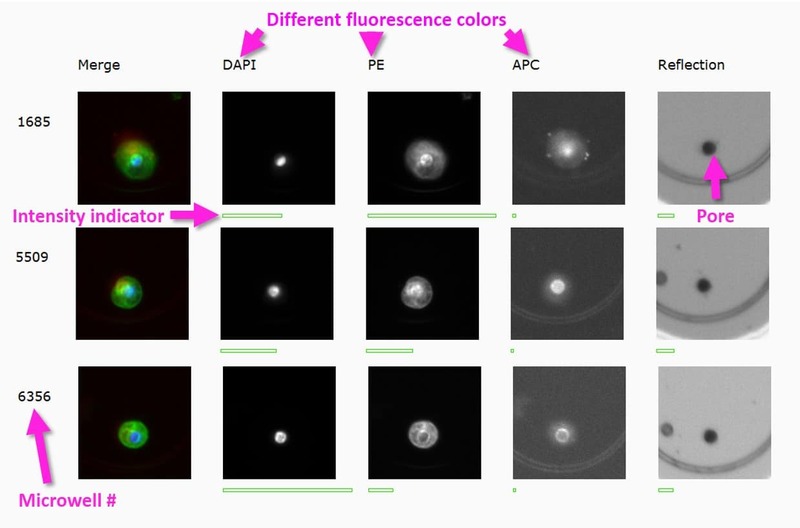 The cells of interest are selected based on their fluorescence image. To isolate these cells, the microwell bottom together with the cell is punched from the microwell chip into in a PCR plate or PCR tube. VyCAP offers a complete, easy to use, validated and automated solution to isolate single cells. The solution consists of hardware, software and protocols. Downstream protocols to perform single cell RNA or DNA analysis are available. Contact us for more information or to schedule a demo. Enrichment of CTC using RosetteSep™ is a relative simple method. After enrichment and fluorescent labeling ( DNA, Cytokeratin, CD16 and CD45) the samples are transferred to the microwell chip. Fluorescence images are acquired. The Puncher software generates a list of potential cells of interest. The user makes the final selection and determines to which well or tube the selected cell needs to be transferred. From the total number of CTC present in whole blood, 30% of the CTC will be isolated successful as single cell in the DNA / RNA reaction tube or PCR plate. The gallery below displays CTC found in the blood of a metastatic prostate cancer patient. After selection of the CTC, these were isolated into a 200µl Eppendorf tube. After isolation whole genome amplifiction (WGA) was applied using AMPLI-1, see our single cell WGA protocol. The quality of the WGA DNA is determined using VyCAP’s WGA quality control mix. 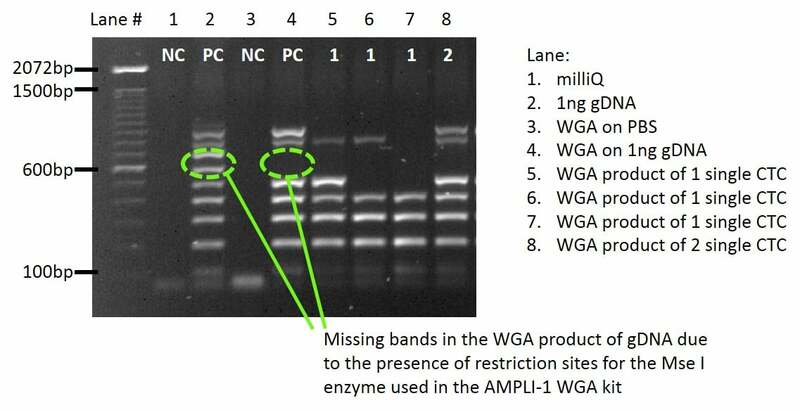 The image below presents the WGA QC results for single cells (lane 5, 6, 7) and for 2 cells (lane 8). The Parsortix system uses a microfluidic cassette to trap circulating tumor cells based on their size. After processing whole blood, the cassette contains approximate 10.000 trapped cells (CTC + leukocytes). The trapped cells are fluorescently labelled inside the Parsortix cassette using Parsortix’s labeling procedure. Next, the cells are retrieved from the cartridge and transferred directly to VyCAP’s single cell disposable. The total recovery from whole blood towards isolated single cells, using Parsortix in combination with our Puncher technology, is 30-40%. Using the VyCAP imaging system the Parsortix cassettes can also be imaged and the number of captured CTCs can be enumerated automatically using VyCAP software or ACCCEPT. CTC are enriched from a whole blood sample using the CellSearch Autoprep CTC X9 protocol. The enriched and labelled cell suspension is transferred to VyCAP’s single cell disposable. The collected circulating tumor cells in the microwell chip can be enumerated and isolated for single cell DNA or RNA analysis.The total recovery using the CTC X9 protocol from whole blood to single cells in combination with our single cell isolation technology is 50%. Isoflux beads or other commercial available beads can be used to enrich whole blood. After the enrichment step the cell suspension is transferred to the microwell chip and the cells are isolated using the Puncher system. The magnetic beads need to have diameter that is smaller than the diameter of the microwell pore. At the moment we have no validated protocols available for Vortex or Clearbridge in combination with our Puncher technology. Harvested suspensions are expected to be compatible with VyCAP’s Puncher technology. Contact us for more information.